Vesicle.org is an open knowledge site for biological vesicle research, engineering, and utilization. In cell biology, a vesicle is a relatively small intracellular, membrane-enclosed sac that stores or transports substances. The vesicle is separated from the cytosol by at least one lipid bilayer. If there is only one lipid bilayer, they are called unilamellar vesicles; otherwise they are called multilamellar. Vesicles store, transport, or digest cellular products and waste. This biomembrane enclosing the vesicle is similar to that of the plasma membrane. Because it is separated from the cytosol, the intravesicular environment can be made to be different from the cytosolic environment. Vesicles can fuse with the plasma membrane, releasing their contents outside the cell. Vesicles are a basic tool of the cell for organizing metabolism, transport, enzyme storage, as well as being chemical reaction chambers. Many in the endoplasmic reticulum, or are made from parts of the plasma membrane. Transport vesicles can move molecules between locations inside the cell, e.g., proteins from the rough endoplasmic reticulum to the Golgi apparatus. Synaptic vesicles are located at presynaptic terminals in neurons and store neurotransmitters. Lysosomes are membrane-bound digestive organelles that can digest macromolecules (break them down to small compounds) that were taken in from the outside of the cell by an endocytic vesicle. Matrix vesicles are located within the extracellular space, or matrix. Using electron microscopy but working independently, they were discovered in 1967 by H. Clarke Anderson and Ermanno Bonucci. These cell-derived vesicles are specialized to initiate biomineralization of the matrix in a variety of tissues, including bone, cartilage, and dentin. During normal calcification, a major influx of calcium and phosphate ions into the cells accompanies cellular apoptosis (genetically determined self-destruction) and matrix vesicle formation. Calcium-loading also leads to formation of phosphatidylserine:calcium:phosphate complexes in the plasma membrane mediated in part by a protein called annexins. Matrix vesicles bud from the plasma membrane at sites of interaction with the extracellular matrix. Thus, matrix vesicles convey to the extracellular matrix calcium, phosphate, lipids and the annexins which act to nucleate mineral formation. These processes are precisely coordinated to bring about, at the proper place and time, mineralization of the tissue's matrix. Multivesicular body, or MVB, is a membrane-bound vesicle containing a number of smaller vesicles. 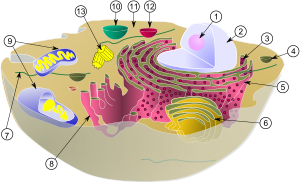 Schematic showing the cytoplasm, with its components (or organelles), of a typical animal cell. Organelles: (1) nucleolus (2) nucleus (3) ribosome (4) vesicle (5) rough endoplasmic reticulum (6) Golgi apparatus (7) cytoskeleton (8) smooth endoplasmic reticulum (9) mitochondria (10) vacuole (11) cytosol (12) lysosome (13) centriole. Some vesicles are made when part of the membrane pinches off the endoplasmic reticulum or the Golgi complex. Others are made when an object outside of the cell is surrounded by the cell membrane. The assembly of a vesicle requires numerous coats to surround and bind to the proteins being transported. One family of coats are called adaptins. These bind to the coat vesicle (see below). They also trap various transmembrane receptor proteins, called cargo receptors, which in turn trap the cargo molecules. The vesicle coat serves to sculpt the curvature of a donor membrane, and to select specific proteins as cargo. It selects cargo proteins by binding to sorting signals. In this way the vesicle coat clusters selected membrane cargo proteins into nascent vesicle buds. There are three types of vesicle coats: clathrin, COPI and COPII. Clathrin coats are found on vesicles trafficking between the Golgi and plasma membrane, the Golgi and endosomes, and the plasma membrane and endosomes. COPI coated vesicles are responsible for retrograde transport from the Golgi to the ER, while COPII coated vesicles are responsible for anterograde transport from the ER to the Golgi. The clathrin coat is thought to assemble in response to regulatory G protein. A coatomer coat assembles and disassembles due to an ARF protein. Surface markers called SNAREs identify the vesicle's cargo, and complementary SNAREs on the target membrane act to cause fusion of the vesicle and target membrane. Such v-SNARES are hypothesised to exist on the vesicle membrane, while the complementary ones on the target membrane are known as t-SNAREs. Regulatory Rab proteins are thought to inspect the joining of the SNAREs. Rab protein is a regulatory GTP-binding protein, and controls the binding of these complementary SNAREs for a long enough time for the Rab protein to hydrolyse its bound GTP and lock the vesicle onto the membrane. Fusion requires the two membranes to be brought within 1.5 nm of each other. For this to occur water must be displaced from the surface of the vesicle membrane. This is energetically unfavourable, and evidence suggests that the process requires ATP, GTP and acetyl-coA, fusion is also linked to budding, which is why the term budding and fusing arises. Membrane proteins serving as receptors are sometimes tagged for downregulation by the attachment of ubiquitin. After arriving an endosome via the pathway described above, vesicles begin to form inside the endosome, taking with them the membrane proteins meant for degregation; When the endosome either matures to become a lysosome or is united with one, the vesicles are completely degregaded. Without this mechanism, only the extracellular part of the membrane proteins would reach the lumen of the lysosome, and only this part would be degraded. It is because of these vesicles that the endosome is sometimes known as a multivesicular body. The pathway to their formation is not completely understood; unlike the other vesicles described above, the outer surface of the vesicles is not in contact with the cytosol. ^ Anderson HC (1967). "Electron microscopic studies of induced cartilage development and calcification". J. Cell Biol. 35 (1): 81–101. PMID 6061727. ^ Bonucci E (1967). "Fine structure of early cartilage calcification". J. Ultrastruct. Res. 20 (1): 33–50. PMID 4195919. ^ Katzmann DJ, Odorizzi G, Emr SD (2002). "Receptor downregulation and multivesicular-body sorting" (pdf). Nat. Rev. Mol. Cell Biol. 3 (12): 893–905. doi:10.1038/nrm973. PMID 12461556. This page was last modified on 28 February 2008, at 02:13. This page has been accessed 61,859 times.